A series of low-pressure ripples develops within the ITCZ. These are known as tropical waves and progress from east to west. In the late season, they typically shift their movement toward the west-nothwest, or even northwest, after crossing 45° or 50° W longitude. These tropical waves, ideally embedded in the deep-layer easterly flow, contain a northeast wind shift. This is typically referred to as a “convergence”, where lines of equal atmospheric pressure are pressed together between the high-pressure ridge to the north and the developing low-pressure system. The divergence that results ahead of the convergence zone gives us a notheasterly wind as the axis of the tropical wave approaches. Gusts up to 25 mph may occur. Sometimes there can be gusts to tropical storm force in stronger waves. There can be next to no weather associated with these waves, and they may pass virtually unnoticed. More typically, there are bands of disturbed weather riding the axis of the wave. When the wave passes over warmer waters (SSTs), convection and resulting rainfall are enhanced. This greater rainfall is concomitant with falling surface pressures. By the time these pressures fall to 1008mb, it is likely that the northeast wind has closed off to a southwest wind on the backside of the wave. The forward motion of the wave completes the closure on the northern side of a broad low-level center, and a tropical depression has formed. We often hear that a tropical depression has formed, but conditions are unfavorable for further development. There are two conditions that must be present for the tropical depression to continue its development: warm SSTs (above 79° Fahrenheit/26° Celsius) and low vertical shear. A tropical cyclone derives its power from the warm waters below. In addition, a strong anticyclone directly above the low-level inflow is favorable. As a tropical cyclone is pulling in warm, moist air at the surface, it must also evacuate this inbound flow aloft. This occurs in the upper levels of the atmosphere, where high pressure facilitates the development of the cyclone by evacuating the flow from the lower levels of the cyclone. Every powerful hurricane has an equally powerful high pressure system over it. At the surface, the air spirals inward in a counter-clockwise direction, rises in the developing center, and spirals out at the top in a clockwise direction. In the Southern Hemisphere, it is reversed: clockwise inbound, counterclockwise outbound. If the upper-level high pressure system does not develop over our cyclone, it means there is shear instead. This is a strong jet of air that is blowing directly over the cyclone, ripping the tops off the deep convection. This has the effect of breaking down the whole mechanism. This is known as vertical shear. Vertical shear usually comes from a westerly direction, and can occur if the cyclone is located in an unfavorable position near a cold front or upper-level low pressure system. Another factor that can interfere with the development of a tropical cyclone is subsidence. Subsidence is the sinking of air. This happens on the edge of an upper-level high-pressure system. Subsiding air has the effect of suppressing thunderstorm formation. This also is why a tropical storm that tries to form near an established hurricane has a very difficult time—the cyclone is on the edge of the hurricane’s upper-level outflow, and may have to contend with both subsidence and shear. The effect of shear on a cyclone can range from a failure to thrive to catastrophic collapse of the tropical cyclone’s support structure. 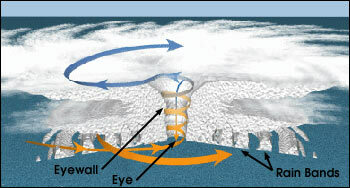 Tropical cyclones have the low-level circulation and the upper-level circulation (outflow), whose formation was discussed above. There is also a mid-level circulation. The mid-level circulation is similar in structure to the low-level circulation, and is critical to the survival of a tropical cyclone that is passing over land. The lowel-level circulation can be severely disrupted, or even dissipated, by interaction with land, especially mountainous terrain. If the mid-level circulation remains intact, the cyclone can regenerate rapidly when it reemerges over water, providing other factors are favorable. Assuming all the ingredients are in place—warm SSTs, upper-level high pressure, and falling surface pressures—the cyclone will develop and reach a point of rapid intensification. It is one of nature’s perfect machines. As warm waters feed the convection swirling around the center, heavy rainfall lowers surface pressures, high pressure aloft evacuates the inflow, which intensifies the inflow of warm, moist air, which in turn increases the rainfall and brings about a more rapid fall in central pressure. Eye formation begins when a tropical storm reaches approximately 65mph, provided conditions are favorable for strengthening to continue. The eyewall begins to make its appearance, usually on the eastern (Northern Hemisphere) edge of the center. As the system becomes better organized and stronger, the center contracts from about 200 miles across to roughly 90 miles at this stage. An increase in rotational velocity accompanies the smaller, more defined center. The inflow is spiralling in ever faster as it is evacuated up through the developing eyewall and out by the high pressure outflow structure. The eye begins to appear as a clear spot in the center, as the air here is sinking. The eyewall creates subsidence that not only helps clear the eye, but can also produce a feature known as the “moat”, which is an area of relatively weak convection outside the core of the tropical cyclone. The combination of eye and moat can make the storm’s core look like a doughnut. The eye can have a diameter anywhere from 10 to 40 miles across. Tropical cyclones can exhibit a great deal of durabilty provided that the upper level support remains and the southerly (Northern Hemisphere) inflow is present. The worst thing that can happen is for this southerly (or equatorward) inflow to get cut off. Here are some examples: In 1998, Hurricane Mitch developed into a supermassive Category 5 hurricane. Nevertheless weakening began when the center moved to a position directly north of Honduras, cutting off the southerly inflow, even though the eye was still over a hundred miles off shore. Later, Mitch maintained its mid-level core against all odds over the mountains of Central America because he was able to advect moisture from the East Pacific. Reintensification to tropical storm strength was almost immediate after reaching the Bay of Campeche. Mitch never dissipated. In 1988 Gilbert hit the Yucatan near Cancún as a Category 5 hurricane. The Yucatan peninsula, though flat, extended far enough south through the critical southerly inflow zone that Gilbert never recovered, even after moving over the open waters of the western Gulf of Mexico. Contrast this with the northern Gulf coast and numerous examples from Camille to Elena and beyond, where the proximity of the eye to land is not necessarily a weakening factor, although the relatively extensive shelf water can sometimes be an inhibiting factor, if a slow-moving storm generates enough upwelling. A recent Southern Hemisphere example of this is Severe Tropical Cyclone Monica, which developed into a “super cyclone” just north of Australia. The northerly (equatorward) inflow over the Arafura Sea fueled this system. What are the factors that contribute to the decay of a tropical cyclone? They are Upwelling, Entraining dry air, Moving over cool waters, Exposure to upper-level westerlies, and finally Landfall. Upwelling. When a hurricane stalls, its movement is has fallen below 5mph, or its movement is erratic over a small area, the wave action caused by the strong surface winds churns the ocean surface and produces upwelling. This has the effect of cooling the temperature of the sea surface over an area 200 to 300 miles across. The result is weakening. It is possible for a hurricane to stall in one area long enough that it dissipates. In 2004, Hurricane Frances stalled off the southeast Florida coast long enough that the core of the hurricane collapsed. Frances eventually made landfall as a Category 1 hurricane, instead of the earlier expected Category 3. Entraining dry air. Sometimes, during the peak season, when tropical cyclones approach contintental land masses, they may entrain dry air as part of their interaction with frontal troughs that carry cool, dry air behind them. It is one of the ironies of the Atlantic Hurricane Season that, just when things get going, it’s already September and the strength and frequency of cold fronts is increasing. These fronts interfere by deflecting the hurricane or injecting dry air into the circulation, or both. The dry air kills the convective masses that drive the hurricane’s engine. If the dry air entrains deeply enough, it can cause significant weakening. Moving over cool water. Similar to upwelling, when a tropical cyclone moves over cool water (below 77° Fahrenheit/25° Celsius), it begins to weaken. Eventually this causes dissipation, particularly in the East Pacific. In the Atlantic, if the storm is caught in the mid-latitude westerlies and begins to recurve to the northeast, it generally becomes an extratropical storm by the time it has reached about 45° W. This is the so-called “graveyard” of Atlantic hurricanes. The storm becomes extratropical when it has transitioned to a cold-core, baroclinically driven system, and eventually becomes a gale in the north Atlantic, or is absorbed by a large gale. There have been times when a hurricane passes north of the Azores and hits the British Isles as a Force 8 or stronger gale, having maintained a recognizable inner core. Exposure to upper-level westerlies. It happens that the ridge of high pressure that keeps the hurricane heading toward the west frequently breaks down. In the Atlantic Ocean, this may result in strong upper-level westerlies diving down and impinging on the northern edge of the hurricane’s upper-level support structure. Poleward outflow is restricted. A hurricane can still thrive when outflow is restricted in one quadrant. If the forces responsible for the constricted outflow bear down too strongly, the hurricane undergoes acute shearing. As outlined above, this can be devastating. After landfall. Tropical cyclones cannot survive over land, once their access to warm SST is removed. A powerful hurricane, such as Hugo, which hit Charleston, S.C. in 1989, can project life-threatening hurricane force winds over two hundred miles inland. As the storm progresses inland, it can dump a huge amount of rain—sometimes measured in feet. The storm may evolve into a frontal cyclone that continues to cause widespread damage. The best example of this is Hurricane Camille in 1969—the strongest hurricane ever to make landfall on the continental United States with winds sustained at 190 mph and gusts well exceeding 200 mph—which roared up the Mississippi Valley and eventually exited off the East Coast. Camille maintained tropical storm strength as far as Memphis, Tennessee. Most hurricanes will diminish in strength rapidly after landfall, reaching tropical depression strength by 48 to 72 hours. The main threat from the dying storm is from tornadoes and inland flooding. The right-hand quadrant of a hurricane or typhoon (in the Northern Hemisphere, left-hand in the Southern Hemisphere) is most frequently the strong side of the storm. This is because the forward motion is added to the counter-clockwise punch of the storm. Thus, the right-hand side of the hurricane contains the strong on-shore flow. This is where the maximum storm surge flooding, and the greatest potential loss of life, will be experienced. After landfall, the friction of the circulation moving over land causes a great deal of turbulence, which results in tornadoes. These are especially likely in the forward right-hand side of the storm’s path. The dying cyclone will dump many inches of rain. The lack of access to a warm sea surface results in the death of the tropical cyclone. It usually merges into a frontal trough, or dissipates.